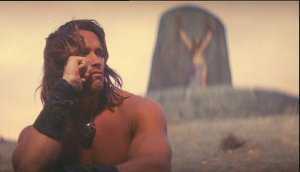 Some fans were very excited when some hints came up in May that Conan the Barbarian should get a new Extended Cut in the USA. But disillusionment set in when a Blu-ray from the UK was released, more than one month earlier than the US Blu-ray, only containing the already known Extended Version. A comparison between the two blu-rays showed that the two versions are actually different and that the US version really is a "new" Extended Cut, even though there are only plain and already known differences. While the old US DVD is identical to the Extended Cut of the UK Blu-ray, they changed back an alteration between theatrical version and the Extended Cut for the US Blu-ray. In other words, the US Blu-ray features at a certain point an alternative scene of the theatrical version, while the old US DVD and the new UK Blu-ray contain the alternative scene of the Extended Version. In addition, the UK Blu-ray shows either the additionally censored UK version of the Extended Cut or the uncensored version, depending on the settings of the Blu-ray player. The logos at the beginning differ. The US Extended BD contains a short shot at this point in which Conan turns away from the princess after she had told him that Thulsa Doom will kill him. 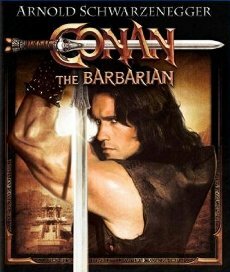 The UK Extended BD contains a longer scene with Conan and Subotai instead. 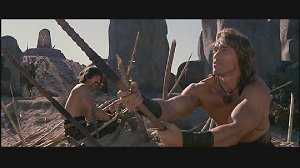 Conan and Subotai sharpen some sticks for building traps and a blockade against riders. While doing that, Conan talks about how he used to walk around in the forest with his father on such spring days, about the dark and green leafs and how sweet the air smelled. 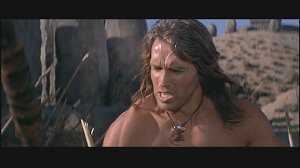 Upset he rams a spear into the sand and he says: "20 years of senseless fighting, no rest and no sleep like other men"(no exact wording). 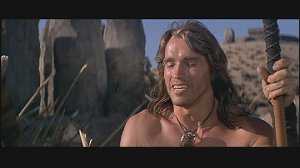 Conan asks Subotai if he knows these winds and he says that they blow in his home too. The conversation goes on like that for a little while until Conan says that there is no spring for men like them, just the fresh wind before the storm. 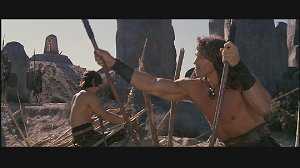 The scene in which Conan digs a hole with his shield and prepares to fight follows; this scene can also be seen in the US Extended BD again.